This is Gary Campbell, Registrar of Sightings at Loch Ness, with Pterichthyoides Milleri, better known as 'Pessie' - a distant ancestor of Nessie. Pessie was found close to Loch Ness by reknowned geologist Hugh Miller (hence the proper name) in the 19th Century and currently lives in Inverness Museum where she's on permanent display. 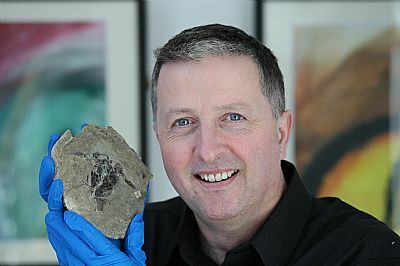 It was only when museum curator Cait McCullagh and Inverness Science Festival organiser Dr Evelyn Gray were researching Nessie's history for the 2015 festival that Pessie came to light, having hidden in the museum's collection for over 100 years. Cait McCullagh explained “If you think of the picture that most people have in their heads of the Loch Ness Monster, our fossil pretty much meets what they would expect. Pterichthyoides Milleri lived at the bottom of freshwater lochs and had flippers to help it move around. Interestingly, its head and back were covered in an armoured shell, showing that it was well protected from predator attacks – ready for anything!" On whether it could be Nessie's ancestor, Dr Gray said "if we assume that this form of Nessie would evolve in a normal fashion, then we can project how biological changes over the millennia might make it similar to the larger Nessie we think of today"